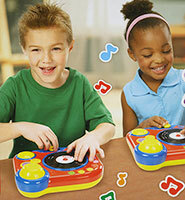 Fun sound effects let kids play around and get creative with music. Jam with 5 songs supplied or create your own. Slow down / speed up each song. Spin the turn Table for DJ style scratch effects.